This is a tiny old-fashioned candy shop full of candy you love, candy you’ve never heard of and candy you probably can’t figure out how to pronounce. But you’re going to love it. You might leave this store with bags… or pounds… of candy, but it’s okay, because you’re going to be really happy and nostalgic… and it’s all very high quality. Every candy you remember from your childhood – and didn’t believe was still in existence – is alive and well at The Sweet Shop. Why it’s worth it: It’s everything you could possibly want in one storefront: a candy store and an ice cream shop. There is something for everyone here, from super modern ice cream and gelato flavors to retro sweets, including sugar, nut and gluten free items. Vibe/layout: The shop has whimsical boutique-y vibe to it that makes it a gem on the UES, a downtown-y shop magically transported uptown. 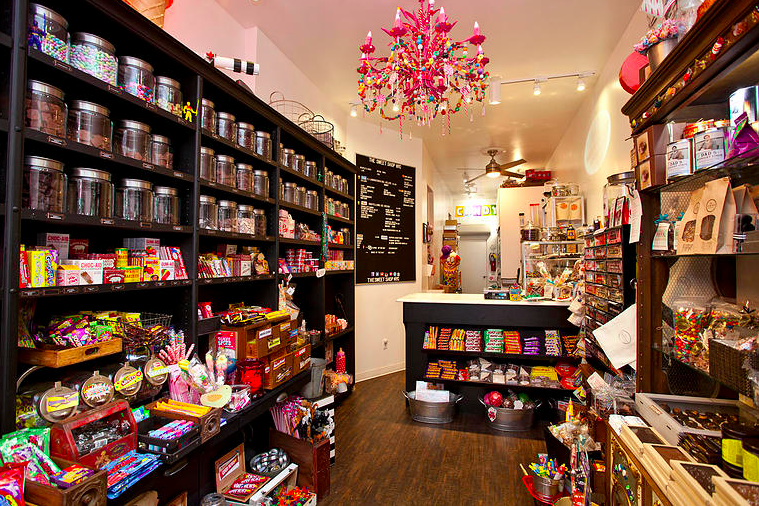 Outfitted in all things candy, including a handmade candy chandelier (by the owner) and a commissioned candy mirror, The Sweet Shop is decked out from ceiling to floor in personality. People behind the ‘straunt: This shop is owned and operated by family man, Kelly Jamie, who makes all the in-house goods, his wife, Glyn, who designed the shop, and their son, Matt, who works and socializes by his parents’ sides. F.Y.I. : This is more than just a candy shop; this is a home base. So much so, that one man, who consistently gets in “trouble” from his significant other for sneaking down to the candy store for an evening snack, proposed to his fiancé in the shop! …We should also mention that 3KT (Terese Giudice’s daughters’ band) featured this shop in their music video Season of Joy. Prices: Dependent on items purchased. Watch out, they have a loyalty card. Why it’s worth it: 1. The pan-fried lamb dumpling shooters. 2. The bathrooms. 3. No reservations needed. Need we say more? Read on. Vibe/layout: Anchored by a ship length communal table, RedFarm is a bright and cozy 82-seater filled with modern farmhouse decor. The easygoing space also features booth seating and a full bar in the rear. Although the bathrooms, and specifically the futuristic Japanese toilets, are a talking point (I mean the lid automatically opens when diners open the bathroom door), the dishes still take center stage. I must note that if I were Ed Schoenfeld, the owner, I would be as proud of the cuisine as I was of the bathrooms. 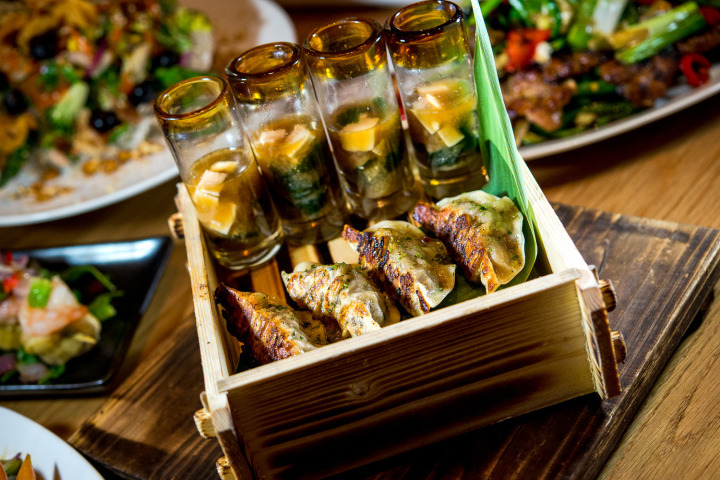 Ideal meal: The pan-fried lamb dumpling shooters served with miso tofu-seaweed broth (4) ($14) are a completely mind-blowing experience. Their delicate texture and well-executed pairing leave you craving more. Prices: While the atmosphere is rustic and comfy casual, the prices are on par with upscale eateries in the area ranging between $8 and $29 per plate. Why it’s worth it: After a nice walk on a brisk day or before heading to the Barclay’s Center, you’ll be craving a steaming bowl of unsophisticated and delectable ramen. 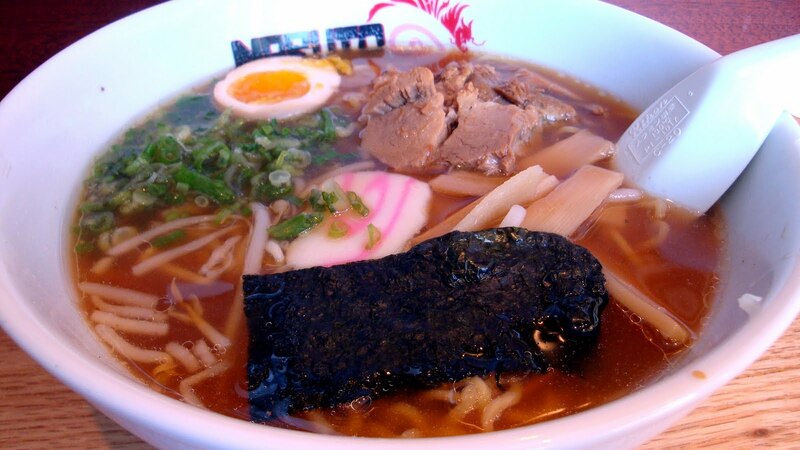 Naruto Ramen offers a limited menu, that definitely doesn’t try too hard. Vibe/layout: This is not important. Don’t take your parents here or go on a first date here. This is for serious ramen go-ers only. Ideal meal: 6/6 of our crew devoured the signature dish, Naruto Ramen ($9). The noodles have great consistency and the right density, while the soup offers a lot of depth in the soy sauce flavor. Why it’s worth it: The perfect day in Manhattan consists of brunching and shopping…in Soho of course. If you’re looking for a pretty restaurant serving pretty food to pretty people, and more specifically, a charming, market-to-table venture, with an adjacent vintage cocktail bar, we’ve got you covered: Chalk Point Kitchen. Vibe/layout: This 70-seat ‘straunt bolsters the country-in-the-city scheme, in an airy and lush space with white-washed wooden plank walls lined with vintage mirrors and tchotchke-packed shelves. The farmhouse feel of CPK complements the locally sourced and organic menu; however, the most defining aspect of CPK is its downstairs bar, the Handy Liquor Bar, which is a classic, sophisticated and timeless cocktail bar with a fun twist: a fireplace and every 90s childhood game you can think of… yes we’re talking Hungry Hungry Hippos and Operation. F.Y.I. : The full-fledged piano bar below CPK, the Handy Liquor Bar, is named after Thomas Hardy, one of the first expert barmen in the US in the 1800s. People behind the ‘straunt: Nightlife operator Matt Levine (Sons of Essex) and Michelin-starred chef Joe Isidori (Arthur on Smith) teamed up to open CPK, one of our favorite brunch spots in the city. Why it’s worth it: When wandering around downtown, this handcrafted Jewish delicatessen is the perfect pit stop for a Sunday afternoon in the city. Noah Bernamoff, Jewish/Canadian owner, started curing and smoking meats in his apartment while attending law school…and voila! From a hobby emerged Mile End Deli, a hot spot known for its Quebec-style smoked meats in the heart of NoHo. 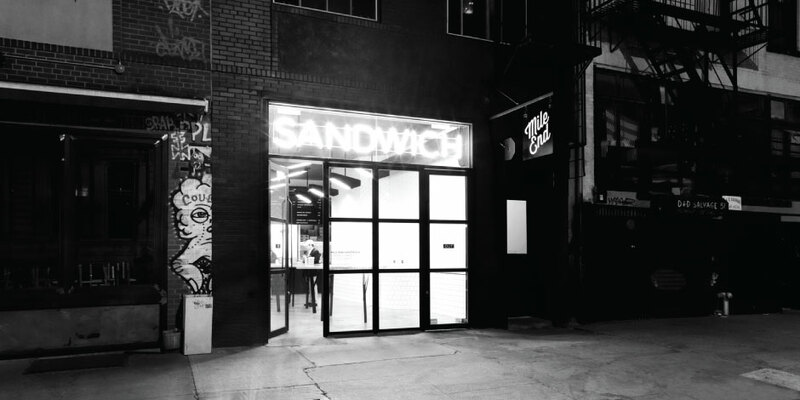 Vibe/layout: This ‘straunt rocks the minimalist black and white theme, with white diagonal subway titles, a black wood-paneled ceiling, concrete floors and a glossy black counter in the back. This is not your homey date spot, but your shiny sandwich/poutine go-to with your homies. Ideal meal: Craving a sandwich? Get the reuben ($13). Craving an adventure? Order the poutine ($9/$12). The gooey cheese curds smothered in rich and meaty gravy sprinkled over hot fries will leave you wishing the chairs were beds and that Mile End Deli had the same hours as Katz’s. F.Y.I. : This is the second location, the Manhattan offshoot, of Mile End Deli in Brooklyn. 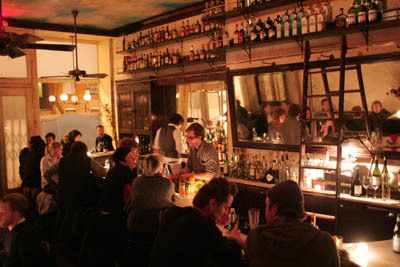 ‘Straunt tip: In the area, but too hangry to wait for a table at Il Buco, Il Buco AV, Gemma or The Smile? Mile End Deli is your answer. Why it’s worth it: The rough warehouse exterior of Roberta’s offers no clues as to the delights inside. Buzzing with swarms of hipsters and foodies, Roberta’s is trek-worthy and offers the best pizza in town. Vibe/layout: Housed in a former garage, this ‘straunt manages to take an industrial-rustic space and turn it into an inviting hipster-vibing hotspot, featuring a large outdoor patio/garden dining area and a backyard studio (for Heritage Radio Network broadcasting). The exposed rafters, wood-paneled walls and rough wooden community tables, dressed with mismatched chairs and paper napkins, set the casual and fun tone of our favorite Bushwick eatery. 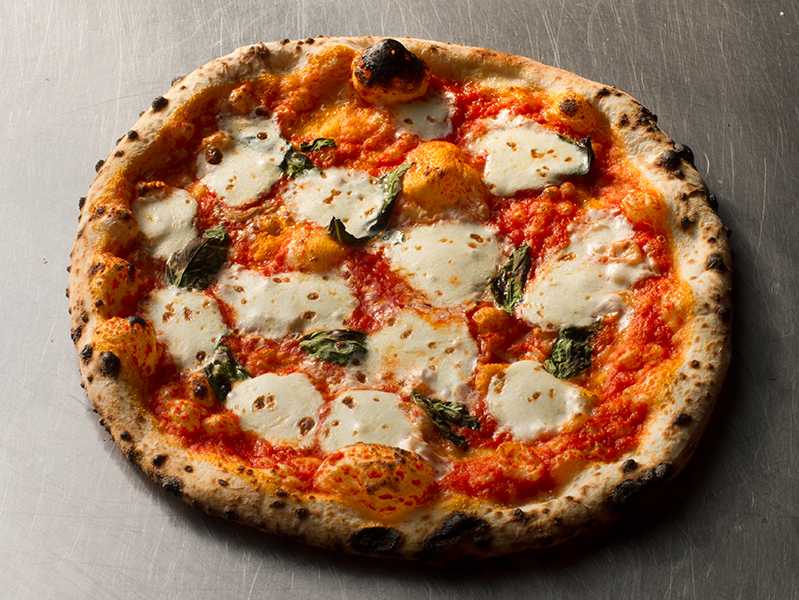 Ideal meal: The soft, puffy crust and house-made fresh mozzarella on the famous original (tomato, mozzarella, caciocavallo, oregano, chili, $14) put this Neapolitan-inspired pizza in the record books. ‘Straunt tip: Roberta’s does not accept reservations, and when your pizza is this good, there will be a wait, so grab a drink at The Narrows bar to pass the time! This is not a hotel bar. We repeat, this is not a hotel bar. According to Eater, there is a vague and long off plan to rent out the rooms above the bar, but at present, the name is strictly for effect. Getting in: Although Hotel Delmano is nondescript from the street with no signage, once inside, one finds oneself in a quaint, mysterious and enchanting room. The front door is barred by a chain as the main entrance is blocked by a bouncer on the side. Don’t be alarmed if they ask you to wait outside. Vibe/layout: The elegantly curved marble bar serves as the centerpiece for this picture-perfect two-room hideaway, adorned with opulent chandeliers, smoky vintage mirrors and black-and-white portraits of old, important-looking people. The bartenders sport suspenders and frequently climb up the wooden ladder behind the bar to fetch bottles on the high up shelves. The cushy banquettes and secluded nooks make this saloon the perfect place for a date night or for catching up with a friend or small group. Drinks: Delicious, beautifully made cocktails for well under $15? We’re in. The Gentle Julep is our favorite (rye, maple, mint, lemon, angostura bitters) ($11). The Pink Cloud (gin, lemon, house-made cranberry shrub, egg white, shaken and served up) ($12) serves as a seasonal runner-up. F.Y.I. : Alyssa Abeta and Zeb Stewart, the Union Pool owners, and Jeff Hansen, the cocktail man, form the team behind this speakeasy.